The follow-up to the successful Loose Parts and your guide to infants and toddlers safely exploring through play. Loose parts capture children's curiosity, give free reign to their imagination, and encourage creativity. A variety of new and innovative loose parts ideas are paired with beautiful photography to inspire safe loose parts play in your infant and toddler environments. Captivating classroom stories and proven science provide the context for how this style of play supports children's development and learning. 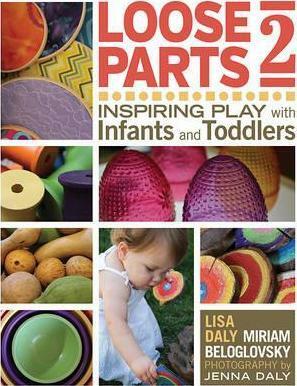 "Lisa Daly and Miriam Beloglovsky's Loose Parts 2: Inspiring Play with Infants and Toddlers provides a sequel to the original Loose Parts and offers new ideas and fine photos to reinforce the concept of early learning play opportunities and strategies. From clothespins and hollow blocks to understanding locomotion in a process that can carry infants and toddlers into more social worlds, each loose part and play opportunity is paired with a child's learning process to provide both lesson plans and learning reinforcement based on a range of loose everyday materials. Miriam Beloglovsky, MA, is a professor of Early Childhood Education at Cosumnes River College in Sacramento, CA, and has had the pleasure of advising and guiding students for over twenty-five years. She is a strong advocate for children, youth and families and consults for programs such as My Street of Dreams. She has served as a keynote speaker, presenter and board member to a number of organizations and conferences. Lisa Daly, MA, is professor of Early Childhood Education at Folsom Lake College in Folsom, CA. She has over 30 years experience as an early childhood teacher, director, and educator. She has served on community and AEYC boards, including the state-wide Child Development Training Consortium advisory board. She is passionate about creative arts and has presented numerous workshops for educators on art, storytelling, language and literacy, sensory experiences, music and movement.